Plastic protector prevents bruised bananas. Bruised bananas are a tragedy all too often experienced by those of us who like to enjoy a banana for lunch or a healthy snack. 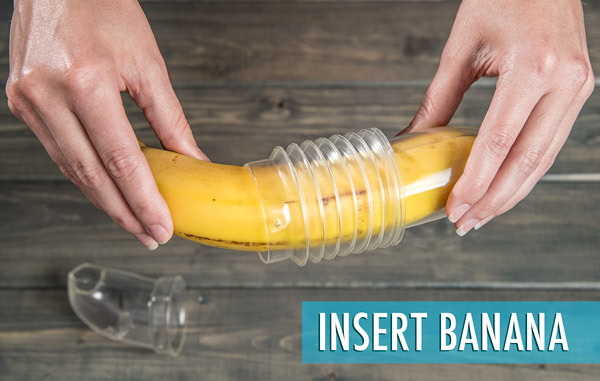 The Banana Bunker is a flexible, plastic device specifically designed to protect your bananas from a messy, squishy fate. The Banana Bunker's innovative design features open ends and a flexible and detachable mid-section. 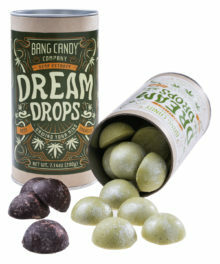 These allow you to adjust the bunker to fit nearly any size and shape of banana. Yes, we're quite aware of what the Banana Bunker looks like. But it works! 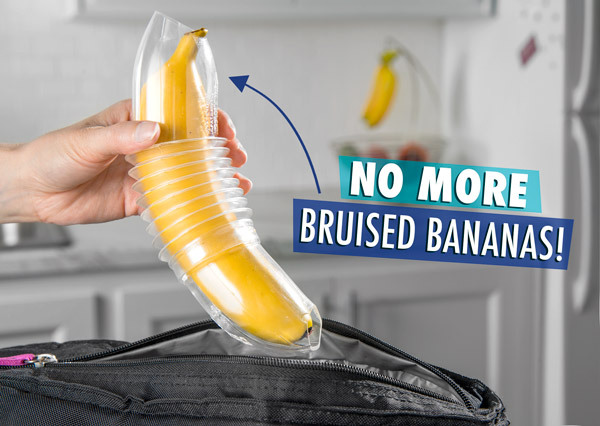 And let's face it, the alternative to a slightly bizarre-looking banana protector is smooshed banana all over your purse or lunch bag. 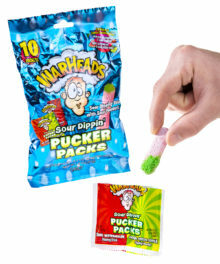 And that's just gross. 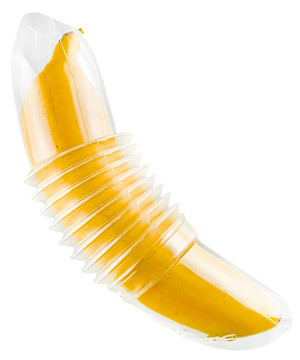 No, it's not a condom...but it does protect bananas. We understand that many people's dirty little minds go into overdrive when they see the Banana Bunker. 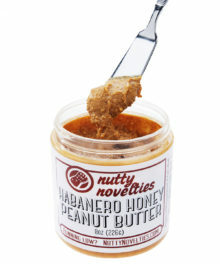 So, we figured we'd address that issue immediately, have a little chuckle, and then move on with our serious banana business. Carry bananas in your purse or backpack without fear of bruising. The Banana Bunker consists of two parts, which make it a very accommodating banana protector. Bend the flexible bottom half of the Banana Bunker to match the curve of your banana. Plastic: Tough, yet flexible. 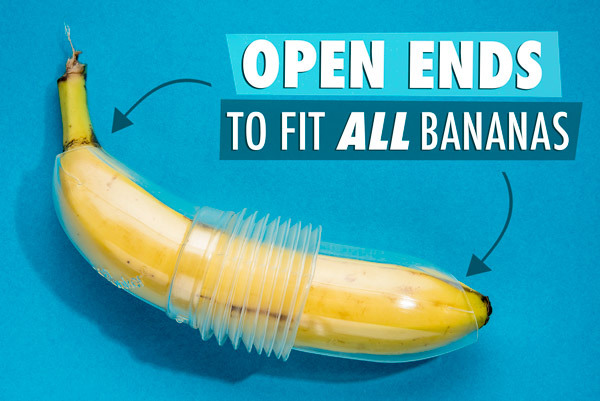 Perfect for b-a-n-a-n-a-s.
Once you've bent the flexible bottom part of the Banana Bunker to match the curve of your banana, insert the banana into the bunker. The flexible Banana Bunker can accommodate almost any type of banana. Holes at each end allow for banana spillover. Your final step is to attach the top half of the Banana Bunker. Your banana is now safe! 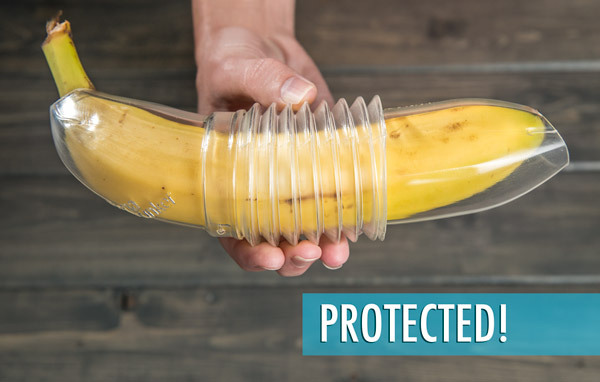 Attach the top half of the Banana Bunker to complete the protection of your banana. 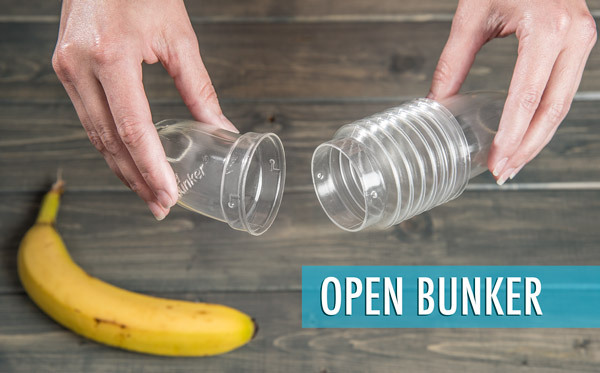 The Banana Bunker's open ends allow extra long bananas to poke out, but still receive protection for the bulk of the banana. Simple, yes. Crucial to proper banana protection? Most definitely. As we all know, not all bananas are the same size. The Banana Bunker gracefully accommodates all sizes. The central section of the Banana Bunker is made from flexible tubing. 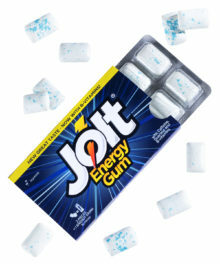 It can be left straight or bend to a nearly 45 degree angle. 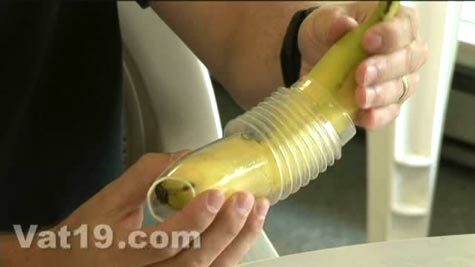 That allows the Banana Bunker to handle even the curviest of bananas. Flexible, yet tough. The Banana Bunker can handle bananas of nearly any curvature.